Norsk Toppfotball (“Norwegian Professional Football League—NPFL”) is an interest organisation for all the clubs in the two highest levels of the football league system in Norway: Eliteserien and OBOS-ligaen. The organisation was founded in 1972 and aims to support and develop the Norwegian professional football scene—giving economic, administrative, and commercial support to the clubs. Norsk Toppfotball wanted a complete relaunch of their 41 websites, as their old platform no longer suited their present and future needs. A search for a new solution was therefore started in January 2016, resulting in over 50 vendors competing for the contract. The biggest challenge facing the project was the fact that it involved 39 different clubs alongside the two leagues. This meant different users, different branding, and different locations all around Norway. One club could for instance have a dedicated digital team, while another club could just have one person who did all the work alone. Flexibility was therefore an important factor. Another challenge was the short timeframe of the project. The process started in January 2016 with a one-year timeframe, but the solutions partner and platform were not decided before April—and the actual work did not commence until May. A number of potential partner candidates claimed that December 2016 was an impossible deadline, fearing that the websites relaunch would end up as a long and complicated process. In spite of the short timeframe, all the websites launched as planned in December 2016—including two sites for the leagues in addition to the 39 clubs. During the production process a focus group was set up, aiming to map common needs and challenges—as well as proposing concrete solutions. Every website received a flexible design that could easily be branded to each club. At the same time the websites maintain the same look and feel, as well as functionality between the different sites and also enabling league branding. In a similar manner, both the layout and amount of content on the websites were kept flexible and customisable. In addition, several different modes were created for the front page of each club. Before a match, the focus is for instance on selling tickets, while during a match the live results are displayed. Finally, after a match one can get a summary and see interviews with the players. Videos delivered by the streaming platform Qbrick are used heavily throughout the website. After the release in December 2016, Eliteserien, OBOS-ligaen, and all the professional football clubs have had one unified platform. 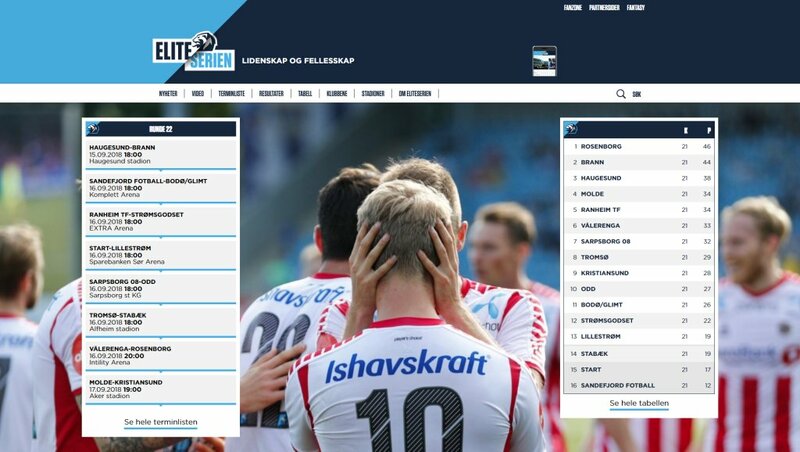 The new websites have given Norsk Toppfotball a better base for sales to national media and partners. Both local and national partners have fixed positions on the websites, providing them with greater value. At the same time is user engagement at an all time high after the relaunch, with both internal and external engagement made easy through accessible tools from Enonic XP. Finally, the website editors feel that the management of the clubs’ digital experiences went from 0 to 100—due to the old solution’s cumbersome operations and lack of user-friendliness. From dedicated developers to content editors, creating and maintaining engaging digital experiences for football enthusiasts all over Norway has never been easier. 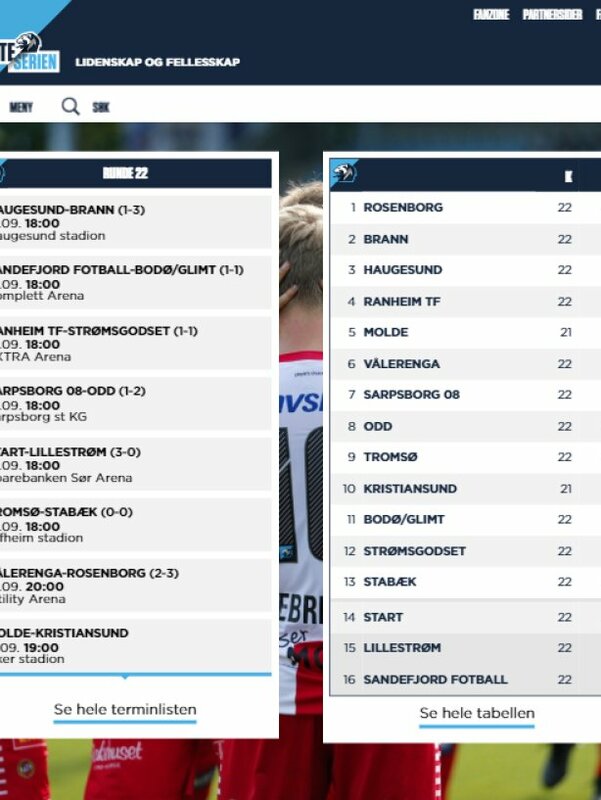 Sites powered by Enonic: eliteserien.no, obos-ligaen.no, glimt.no, brann.no, fkh.no, kristiansundbk.no, lsk.no, odd.no, moldefk.no, ranheimfotball.no, rbk.no, sandefjordfotball.no, sarpsborg08.no, stabak.no, ikstart.no, godset.no, til.no, vif-fotball.no, aafk.no, fotball.florosk.no, hamkam.no, fkjerv.no, kil.no, levangerfk.no, miffotball.no, nestsotra.no, notoddenfk.no, sandnesulf.no, sogndalfotball.no, strommen-if.no, tuilfotball.no, ullkisafotball.no, viking-fk.no, asanefotball.no, arendalfotball.no, brynefk.no, elverumfotball.no, fredrikstadfk.no, hodd.no, raufossfotball.no, honefossbk.no. All the professional football clubs now have one stable and user-friendly platform—with one design that fits all. The new websites have increased brand visibility and user information, giving us better foundations for sales to national partners and new media players.